React: The knight’s armor is supposed to make them secure, but really it tends to get in the way. That helmet keeps the head from easily swiveling and severely limits visibility. Those arm braces and shoulder pads hinder a full range of motion for your arms. Beyond this, all that weight will slow its bearer down and quickly wear him out. If you don’t believe me, just ask Sir Vardas Egan. He thought he had that armor-less Bron whipped. Are there things, good things, in my life that hinder my walk with God? Do the very things that I thought were making me strong and self reliant actually stand in the way of the race God has called me to run? Is the armor I have built around my heart putting me in very real danger of a quick and fatal drowning? What are some things I need to take off that I might trust in God rather than them? Do I need to shed a few pounds? I want to pursue You. I really do, but sometimes this weight is dragging me down. I don’t want to let go. I don’t want to leave myself unprotected. All too often I don’t even realize how counterproductive my self reliance is. Help me strip away my security even as I shed off my sin. Both prevent me from seeing You. Both prevent me from running the race You have called me to. In You alone do I trust. After You alone do I chase. Your posts are very interesting and as a fellow Christian, I really appreciate your reflections on faith. Very relate-able and encouraging. I too need to she some pounds. Thank you for sharing! Oh man, you’re making me think. And I need to. There are things–habits–in my spiritual life that have just begun to feel so weighty and heavy and I’ve relied on them. I was just thinking about armor today. Yes, my armor keeps me from God sometimes; but, for being in the world (which is not always kind), armor can be useful. It is best to know when and how to take it off and with whom. I am not quite sure how you are using this analogy but I have a feeling I don’t quite agree with you. 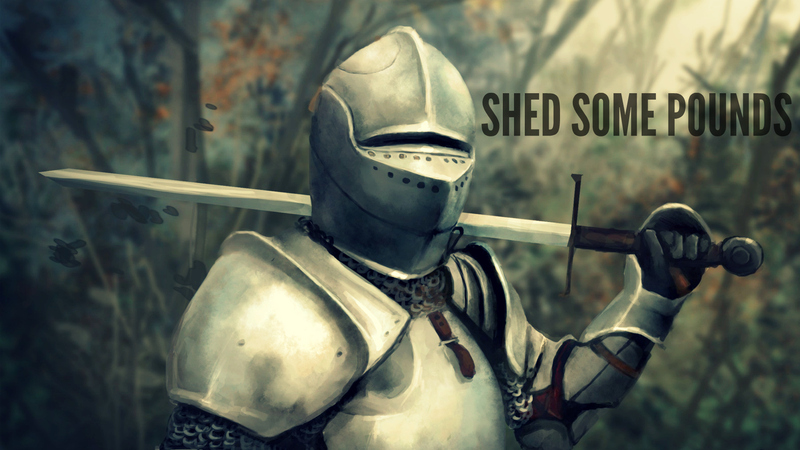 I agree with what you said about shedding our armor to get close to God. I was just saying sometimes (for me, anyway), there’s a little bit of strength that is helpful in dealing with stressful situations. Then I take off my armor in closeness to the divine. I wonder if that makes sense. 1. I love your blog (except for the ads). I wonder if they show up that way on my blog? 3. I could definitely shed some pounds. Thank you. I love the metaphor of men in suits of armor falling off bridges. It made me laugh b/c I so agree with you that we have to relieve ourselves of our own personal armor in order to allow the current of life to take us where we need to do. Otherwise we sink under the weight of our own fears. Good post! A suit of armor, either real or metaphorically, is nothing more than a device to give someone a false sense of security. It makes you feel like you need nothing more to live when in fact it prevents you from living to your fullest. If you strip off your false armor for God you will have true security and will live your life to its fullest. God Bless. Oh my goodness, that cracked me up. Love it. God and I have been “exercising” to help me “shed off some pounds” and it’s been one of the most refreshing moments in my life. Love your writing style too. New follower alert! This is very clever! well done.